This is the small print, you know, the legal stuff. Read it before you acompany us on one of our tours. By accessing, browsing, using and/or completing a reservation through our (mobile) website you acknowledge and agree to have read, understood and agreed to the terms and conditions below. These terms and conditions may be modified from time to time and apply to all of our services. Zipline Iceland is a tour operator, offering zipline adventure tours in Vík, Iceland South Coast. Bookings can be made directly through Zipline Iceland and/or any other website which Zipline Iceland makes their service available. If you are having any trouble reserving you spot through Zipline Iceland’s website, please send us an email. Zipline Iceland reserves the right to alter itineraries and/or timetables should it be necessary, due to adverse weather and/or other related conditions. Zipline Iceland does not take responsibility for any damage, loss, accident or illness or change in travel plans or schedules caused by weather, strikes or any other event outside of Zipline Iceland’s control, such as flight delays, transportation to the meeting point, changes or cancellations, injuries, weather, natural disasters etc. and/or other unforeseeable matters. You are responsible for providing Zipline Iceland with the correct contact information and related details so that we can keep you informed in the event of changes made your booking. All prices for the services provided by Zipline Iceland are based on the current purchasing prices in Iceland, Icelandic Krona (ISK) as shown on our website. As a local operator, Zipline Iceland cannot be responsible for currency fluctuations and/or additional fees outside of its control that may be applied such as bank transfer fees, credit card fees etc. Please note that special offers such as promotional codes cannot be applied to a reservation after a purchase has been made such as in the form of a refund. When offered, promotional codes and/or other special offers must be entered into the relevant field located on the payment page upon check out at the time of booking in order to be valid and applied. By booking a tour either directly through Zipline Iceland and/or any other website which Zipline Iceland makes their service available you agree to all articles relating to payment and our Refund & Cancellation Policy for all parties that are booked and paid for in your name. A cancellation fee of 100% is charged if canceled 12 hours or less before the scheduled tour. A cancellation fee of 50% is charged if canceled 3 days (72 hours) or less before the scheduled tour. A no-show at our meeting point or if you arrive late and the tour has already left there will be no refund issued. An alternative time and/or date will be offered to you instead of the canceled tour. 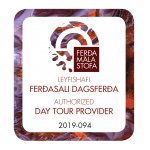 If you accept the alternative tour offer it becomes binding and any cancellations on behalf of the customer will be treated under the same terms as described above. If you don’t accept an alternative time and/or date for the tour a full refund will be issued. Refunds are issued through our payment provider and can take up to 3 weeks to process. Please check with your card issuer or bank if you don’t see the refund appearing in your card statement and please inform us of any issues. Safety is our priority. While our highly trained and experienced guides do their very best to ensure that everyone participating in the tour with us has a safe and fun experience, there is still a slim chance of an accident might occur that may require medical attention. Therefore and as with any world travel, we strongly recommend that you purchase a travel insurance in your home country that covers your cost should you suffer from injury or should you have to cancel your reservation with short notice. Our meeting point is at Vík-hostel, Suðurvíkurvegur 5, 870 Vík, Iceland. You as the traveler are responsible for arriving at the meeting point in time for your tour. This includes being ready at the correct time at the correct location in time for your zipline adventure tour. Zipline Iceland will provide you with information about the meeting point for your tour on your voucher/ticket which is provided upon booking via email. If you are unsure when to arrive for your scheduled tour then please contact us via email. Appropriate footwear, preferably hiking boots with ankle support, and suitable outdoor clothing must be worn. We reserve the right to refuse participation to customers who are dressed inappropriately or with inappropriate footwear since this will put the client’s well-being and safety at risk. Long hair needs to be tied down in a braid or a low bun. Guests/Clients are advised that all activities are undertaken entirely at their own risk and they must behave in a fit and proper manner at all times in accordance with Zipline Iceland and must take proper responsibility for their own safety. All our guests/clients have to have reached the age of 8 years old and weigh between 30 and 120kg. Children under the age of 16 years old will have to be accompanied by an adult. We require that our guests/clients are fit and able to walk on an uneven surface for 3km. Pregnant ladies can not participate in any zipline activity. All adventure tours and outdoor activities can carry inherent risks and Zipline Iceland does not assume any responsibility for accidents that are caused by its customers or can be traced to their own actions or are caused by factors outside of human control. With the purchase of your trip, you agree to these conditions, understand it’s implications and accept responsibility for your participation on your tour. You may be requested to sign an additional liability release. Zipline Iceland welcomes all feedback, both positive as well as negative as it helps us improve our overall services, and performance. We would greatly appreciate it if you could share your tour experience with us. Please note that all complaints must reach Zipline Iceland within 5 days from the completion of your tour. Otherwise, possible compensation is not valid. Text, graphics, logo, photos and all other content on www.zipline.is is owned by Giljagleði ehf. and is all copying and distribution forbidden unless it has been authorized with a written permit. These Terms and Conditions are in accordance with Icelandic law. A court case shall be brought before the Icelandic courts. Zipline Iceland (Giljagleði ehf.) reserves the right to change these terms at any time.